A few week back, I mentioned my ever-growing interest in making needle felted play food. Today, I’m sharing my play food collection so far. Here they are all happy and cuddled together in a crystal bowl. My felted play foods deserve the best, after all! 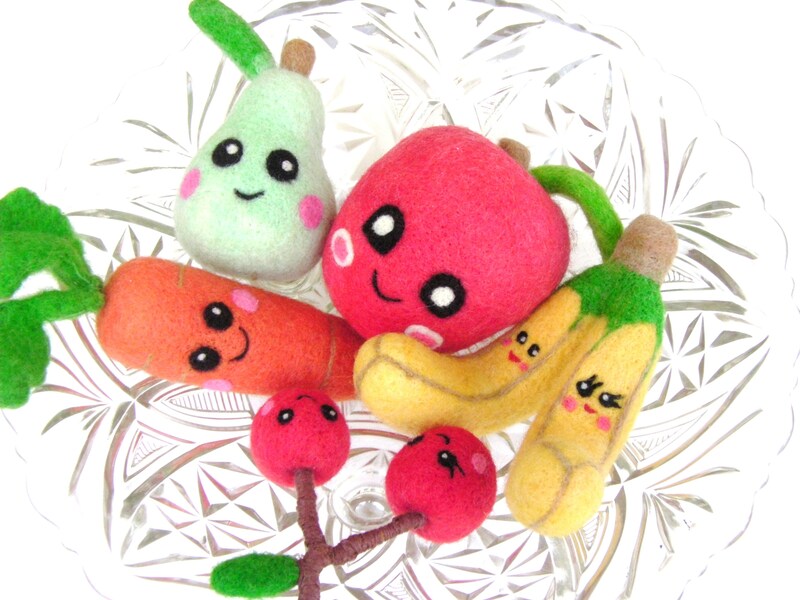 Felting these fruits and vegetables has been so much fun and I still have a lot more ideas. Recently, I have planted a watermelon seed in my garden and it has just germinated. In honor of the delicious, sweet, juicy mess that is yet to come, I will felt a happy watermelon next! If you’ve been following along, you have probably seen a couple of these already. However, I think the pair of cherries is brand new. Feel free to share your handmade play food!